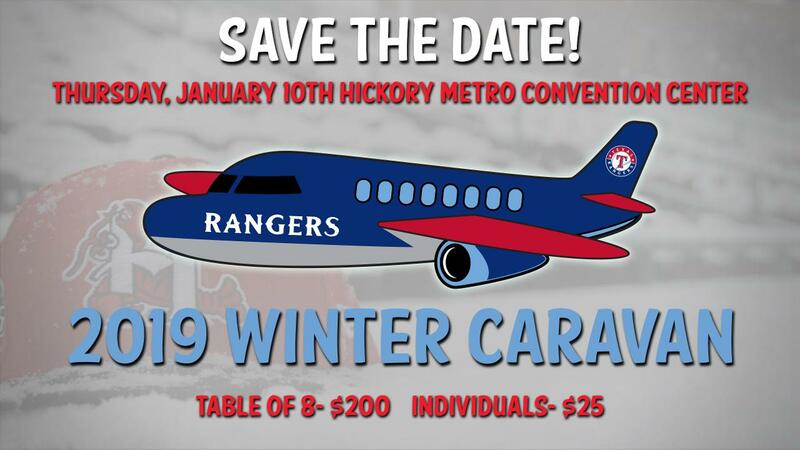 Hickory, NC- The Hickory Crawdads and Texas Rangers have scheduled their 2019 Winter Caravan Luncheon for Thursday, January 10th at the Hickory Metro Convention Center, with the event set to run from 12:00pm - 1:30pm. The luncheon will feature a slate of Rangers personnel and members of the Crawdads coaching staff. The details of the attendees are still developing and will be announced in the coming weeks. "The Rangers always do a great job with this event," said Crawdads General Manager Mark Seaman. "We are excited to launch the 2019 season with our annual Winter Caravan Luncheon." Tickets for the Winter Caravan Luncheon are available now for $25. Ticket price includes the main event and a picnic-style buffet. For more information or to order tickets, call the Crawdads front office at (828) 322-3000 or stop by the 'Dads front office at L.P. Frans Stadium. The office is open Monday-Friday from 9am to 5pm. Tickets may also be ordered online here.